Alia Sharrief arrives for our interview wearing an oversized T-shirt that reads “Danger: Educated Black Woman” over her tunic. It's paired with a flowing red and black hijab. Her grandmother, Margaret Block, was a well-known Black Panther; after she passed away in 2015, Sharrief Googled her name and found photos of her grandmother wearing a T-shirt with the same slogan. That advice has certainly translated to Sharrief’s approach to her work, which deftly reflects her identity: she's a rapper and a women’s rights activist; a black woman and a devout Muslim. It’s not unusual to find her speaking at a protest one day and shooting a music video in a lowrider the next. When she’s not in the studio or performing, she’s organizing youth workshops and running The Hijabi Chronicles, an online platform that celebrates the creativity of Muslim women. 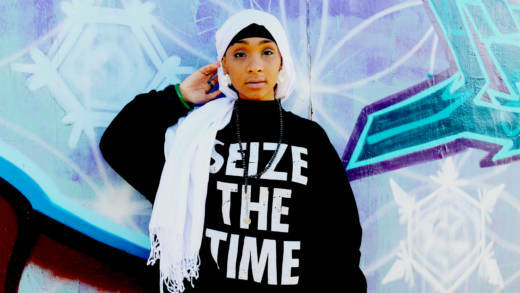 At the moment, Sharrief is working on her upcoming album Back On My Deen, a project with outspoken lyrics and funky, danceable beats with “Bay slap” in them, as she puts it. “Deen,” Sharrief explains, is a word from the Quran that refers to a righteous path. Sharrief wants to use the album to amplify her voice at a time when, she says, Muslim women rarely get a chance to tell their own stories in the media and pop culture. Sharrief is busy these days. Before she releases the album at the end of February, she’s dropping the EP Don’t Forget Me in early January. In contrast to the full-length project, Don’t Forget Me is light-hearted, with feel-good tracks more in the vein of her autobiographical 2012 debut, Mental Cycles & Mood Swings, an album that grappled with self-discovery and coming of age. “I’m not a preacher in my music,” she says of the contrast between the two records, adding that she admires how Tupac and Lauryn Hill balanced making catchy and meaningful work. Her skill in achieving that balance has been obvious enough, at least, to catch the attention of One Drop Scott, a veteran Bay Area producer who worked with Mac Dre; Scott produced Mental Cycles as well. Both he and San Francisco’s Pharoahgahmoe handled production on both of Sharrief’s upcoming projects. Sharrief is originally from Sacramento, and while the rest of her family is Christian, her parents both converted to Islam independently before they met. As an adolescent, Sharrief wanted to be a soul singer but switched to rapping full time after an accident damaged her vocal chords. After relocating to the Bay Area nearly 10 years ago to attend community college, she transferred to California State University, East Bay to study media and broadcasting, and introduce herself to the local music scene. That process was not without its growing pains. Sharrief’s music has grown increasingly, overtly political as she’s become more involved with activism in recent years. In a remix of Beyoncé’s “Formation” called “Information,” she uses a sample of Malcolm X’s speech from the 1964 March on Washington as a hook -- over which she raps lines like I like my hijab on/I stay covered up ’cause I be headstrong, interwoven with lyrics about police brutality. Unsurprisingly, she’s built a following in local conscious hip-hop circles, and has become a regular name at events that combine music and social justice work. In October, she held it down as one of the only female performers at the Black Panther Party’s 50th anniversary rally and concert in Frank Ogawa Plaza, sharing the stage with local legends Mistah F.A.B., Dru Down, and Tajai of Hieroglyphics. Earlier this month at the Fox Theater, she opened for rap legend Yasiin Bey (formerly known as Mos Def), who’s currently on his last tour before he retires from music. The show went so well that Bey invited her to open for him again in Sacramento. Sharrief’s music feels urgent -- especially in light of the recent Trump victory, and the ensuing spike in hate crimes against people of color, particularly against Muslim women in religious dress. But the rapper says she’s not intimidated by the current political climate, in part because rapping offers her a platform to speak truth to power. Indeed, one of the first things Sharrief did after Trump won the election was speak at a protest organized by the Black Power Network. Despite the challenges the next four years promise, Sharrief said it’s important for marginalized people and allies to organize. “I feel like the best way to beat a bully is to stand up to a bully and show him you ain’t gon’ take it,” she says. “And right now, he’s all words. He ain’t got no action. And God willing, he won’t be able to do no action with the power of the people.